Grad student Adam has his hands full with his fiancee, his dead father's conspiracy-theory-obsessed best friend and a mysterious stranger who shows up one day at his bar, Yankee Tavern. When a former professor asks him to come to Washington DC for meetings with some three letter agencies, he finds himself involved in something that he has a hard time believing -- and it might put him and everyone he loves in danger. So when a stranger walks into a bar and orders two drinks, one for himself and one for an unseen friend, it seems like the set up to an old tired joke. But instead of a punchline, we're confronted with urban legends and conspiracy theories - the last great American Tall Tales. From the Apollo 11 "Moon Landing" to "all those hanging chads" to the fall of Building Seven on September 11, playwright Stephen Dietz weaves a story that is plausible enough to blur the lines between fact and fiction and foster much post-show discussion. 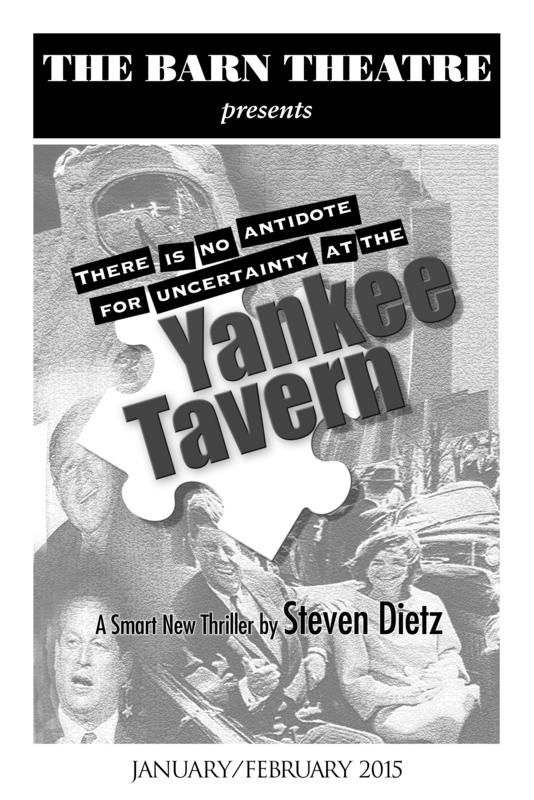 Yankee Tavern is not a study of fact -- of what did or didn't happen -- it's about the agony of uncertainty. To learn more about or purchase BRIDGE MUSIC, the music from our production, please visit www.JosephBertolozzi.com. There is no scheduled performance on Friday, January 23, 2015.